Monday September 10, 2018 - Parliamentary journalists were left shocked and dumbfounded on Monday morning when two MPs scrambled for Sh100 and almost killed each other just to get the note. The incident happened during a committee meeting that was held at Continental House second floor to discuss the rising cases of road accidents in the country. At some point, a Sh100 note fell on the floor and one MP picked and put it in his pocket. “Ooh nimeokota mia, this is good,” said the MP. 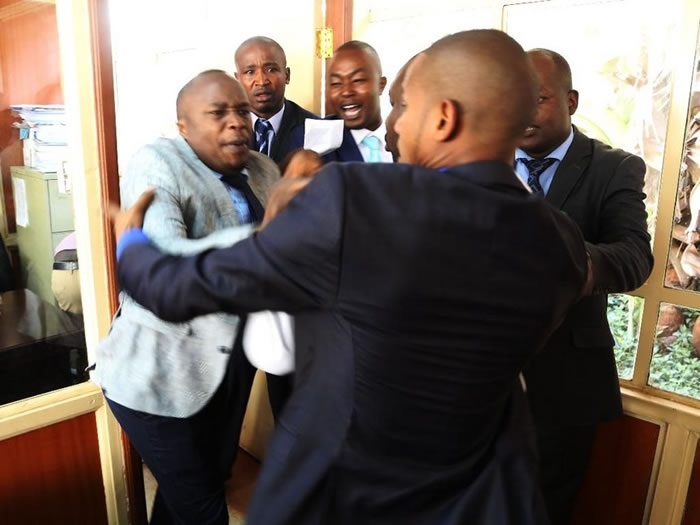 But to his utter surprise, another MP, who was seated next to him, also claimed ownership of the money leading to a small tussle between the two lawmakers. “No, this is my money, give it to me,” claimed the second MP. The MPs almost engaged in a fist fight over the one hundred shilling note as journalists watched in disbelief. Upon realizing that the cameras were still in the room rolling, one of the MPs just left the room in total embarrassment. Kenya is facing harsh economic times thanks to the huge debts that were borrowed by the Government of President Uhuru Kenyatta and his Deputy, William Ruto, and with the 16% tax imposed on fuel, things are worse and even the mighty ones like MPs are feeling the pinch.